5.1 earthquake hits Lake Rukwa, Tanzania. In the Southern Hemisphere: Tropical cyclone 20p (Trevor), located approximately 109 nm north of Mornington Island, Australia, is tracking southwestward at 06 knots. Tropical cyclone (tc) 21s (Veronica), located approximately 185 nm northwest of Port Hedland, Australia, is tracking southwestward at 02 knots. Tropical cyclone 22s (Twenty-two), located approximately 735 nm southwest of Diego Garcia, is tracking southeastward at 03 knots. 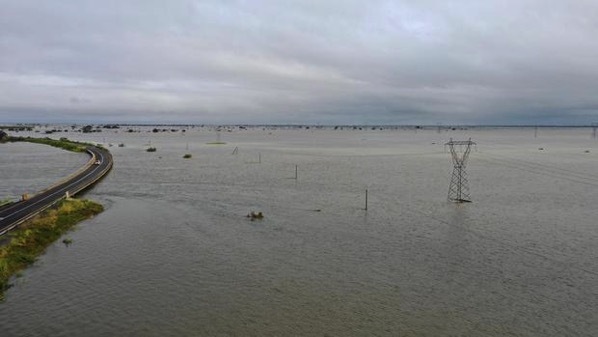 Mozambique – Rescue workers in Mozambique fear that thousands more may have fallen victim to floods which have left a 125-kilometre lake after the African country was hit by cyclone Idai. The storm made landfall near Beira on March 14, leading to storm surges and massive flooding, as well as a massive body of water in an area where hundreds of thousands of people live. In the Buzi region near the severely affected city of Beira, a lake 125 kilometres long and 11 metres deep has formed. In Beira’s hinterland, river levels continue to rise due to prolonged rainfall. Thousands of people are believed to have sought refuge on rooftops and in treetops. In the inland province of Manica, more than 100,000 people are cut off from outside help because transport routes are destroyed. Cyclone Idai, a Category 4 storm, could be one of the biggest cyclone disasters south of the equator, according to the World Meteorological Organization. The epic migration of a tiny bird was tracked as it traveled 12,400 miles back and forth between Alaska and the Amazon. Scientists from Canada’s University of Guelph say the 0.4-ounce blackpoll warbler is one of the fastest-declining songbirds in North America. The record-holding bird was observed taking 18 days to fly from Nome, Alaska, to the Atlantic coast of the Carolinas, where it rested and fattened up for almost a month. The bird then endured a nonstop 2.5-day flight across open water of the Atlantic toward its wintering grounds in South America.